The first trailer for Zac Efron's spiritual sequel to High School Musical that was apparently hijacked by Robert De Niro, Dirty Grandpa, has premiered. The VVS film looks to take what would have essentially become of Troy Bolton and thrown the veteran actor into the mix to wake Efron's character up from the sleepwalking state he's trapped in as Efron's character is a guy who's always done what people expected of him even if those choices went against his own desires. I already feel like this is getting deeper into the character than the movie will though as, for the most part, Dirty Grandpa looks to be more in line with the shenanigans of Neighbors than melodrama of the disaster that was We Are Your Friends. While Efron is actually making a sequel to that Seth Rogen co-starrer that will drop in May of next year it seems this road trip comedy with the hit or miss De Niro will prime us for the antics the actor will get into next summer. 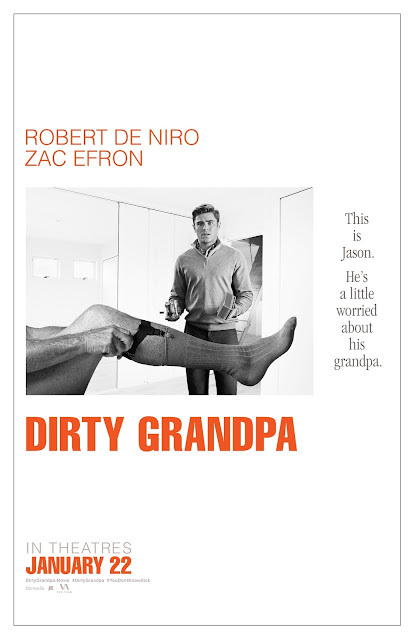 I frame the film this way as I doubt Dirty Grandpa (which I'll inexplicably get confused with Bad Grandpa a thousand times before it's release) will be anything more than a slight diversion, but that isn't to say it won't be a pleasant diversion. The cast is chock-full of solid comedic actors in supporting roles and the trailer in and of itself includes some pretty funny moments without feeling like it's giving away it's best bits. To boot, the first poster for the film is also pretty great. Check out both the trailer and first poster below after the jump. Dirty Grandpa also stars Julianne Hough, Aubrey Plaza, Dermot Mulroney, Jason Mantzoukas and opens on January 22, 2016.